In the catalogue, the film is said to be inspired by “an 1850 daguerreotype of a young American-born enslaved woman named Delia, who was photographed stripped bare as visual evidence in support of an ethnographic study.” But the woman on the screen locks eyes with the audience—whispering that things are “partially true, and therefore totally false”—before her figure is duplicated, flipped upside-down, and inverted like a photographic negative. This is Christopher Harris’s filmmaking. On February 26, Harris, an award-winning experimental filmmaker, returned to Chicago for a screening and discussion at the Rebuild Foundation’s Black Cinema House. Harris’s selections—the first three being what he calls his “Florida films,” and the latter being the “Black diaspora films”—were created over the course of a decade, but hone in on closely-linked themes and motifs: race, urban decay, religion, and suburbia. Needless to say, Harris, who now lives in Florida but was born and raised in the Midwest and attended school in Chicago, has a unique approach to filmmaking—at times, his work feels more like a musical composition than a conventional narrative. In a post-screening conversation with Indiana University professor Terri Francis, Harris talked about his love for experimental jazz and the Art Ensemble of Chicago. 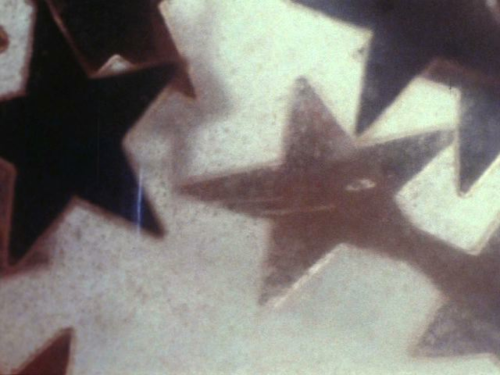 But despite Harris’s love of music, the first film of the evening, the mesmerizing 28.IV.81 (Bedouin Spark), is rendered in absolute silence—for with music, he remarked, it “would have been too cute.” “Spark,” what Harris later called his own “‘music of the spheres’ moment,” is three minutes of tiny silver stars floating in a fluid: macroscopic footage of the night light Harris bought for his daughter when they moved to Florida. The importance of this move and the Floridian environment recurs throughout Harris’s films, but nowhere is it more apparent than in 2007’s Sunshine State (Extended Forecast). The film consists of idyllic suburban footage, awash in a mesh of static—chalk drawings, yellow pinwheels, beach balls floating in a pool. Meanwhile, a narrator with a mid-Atlantic accident speaks calmly about the inevitable heat-death of the sun. Later in the evening, a lighthearted Harris called his move to the suburbs a “traumatic” identity shift: in one moment, he mused on how quotidian life drove him to meditate on the precious and finite nature of life, and in the next, he discussed how strange it was to find a swimming pool in every backyard. 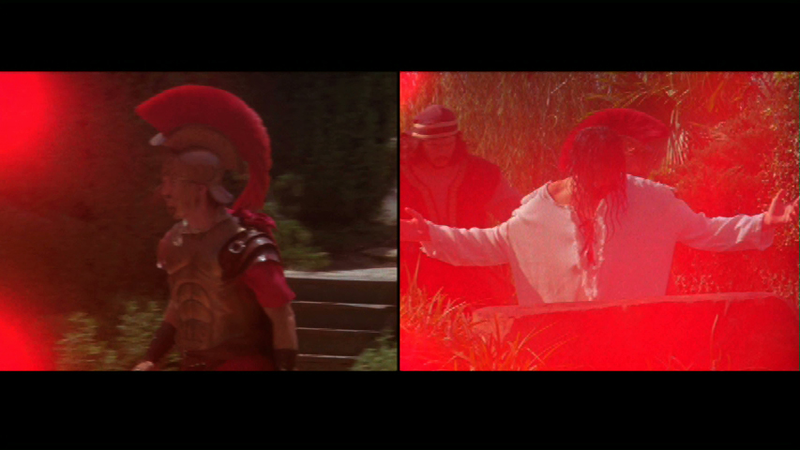 In 28.IV.81 (Descending Figures), the screen is split into two halves; each playing sun-bleached footage of a crucifixion. The film, Harris remarked, was shot at a “Holy Land Experience” theme park in Florida, where tourists would travel to see actors reenact the passion of Christ. “It’s really bad! It’s just not good,” a laughing Harris remarked about the theme park. But despite the kitsch of the subject matter—microphones are visible on the actors’ clothing; visor-clad spectators can be seen wielding camera phones—the image of a Christ in rags being whipped and beaten is somehow moving. As he discussed the film, Harris talked about his fascination with the ways in which a group of people choose to represent their religion. Next up was Halimuhfack, Harris’s newest work. 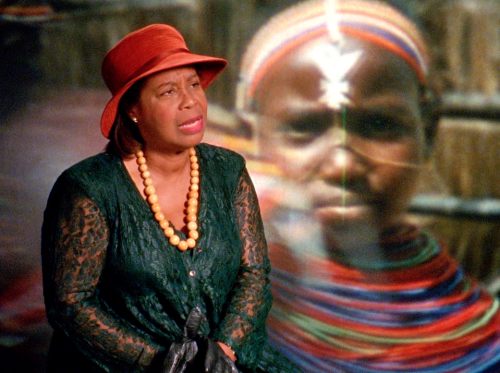 In the garishly colorful short, an actress, superimposed over footage of an African tribal dance, lip-syncs to an interview with Zora Neale Hurston, another adopted Floridian. authenticity.” The film’s artifice is as clear as day: the dialogue is fake, the clapboard is in frame, and the tribe onscreen is the Masai tribe from East Africa, a group that never faced trans-Atlantic slavery. Then, at the end of the film, Hurston’s dialogue snowballs into a thunderous feedback loop. For Harris, Halimuhfack is a foray into the uncanny valley—something he related with the black experience in America. The feedback loop persists in Harris’ other diaspora films: first in A Willing Suspension of Disbelief, then again in Reckless Eyeballing. In the brutalist, black-and-white Reckless Eyeballing (2004), grainy Blaxploitation footage is looped and chopped into coils as a doleful voice whispers that “she will never look,” ad nauseam. But it is the ending of A Willing Suspension that leaves the most lasting impression. After the photographic inversion and the Barthes reading, numbers appear on screen in plain white text. They’re years: from the 1990s, from the 1800s, from the 2000s. Our narrator reads them in a monotone, and her voice piles upon itself. 2008, 1856, 1932: the years are compressed into the roar of feedback. As the evening drew to a close, Harris briefly discussed his own political influences while answering a question from the audience. The ending of A Willing Suspension, he said, is as much about Jim Crow as it is about Laquan McDonald: the years make little difference.